Detail of Ares, Aphrodite and five of the Muses from a painting depicting the procession of gods attending the wedding of Peleus and Thetis. 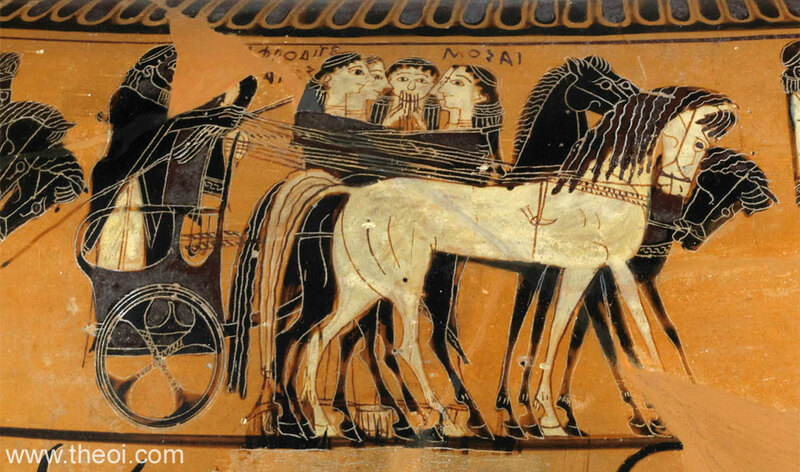 Ares and Aphrodite ride in a chariot drawn by four steeds. Five of the nine Muses stand beside them with the other four following close behind (see image K20.11B). The third Muse in this group is the only forward-facing figure in the painting. She plays a set of pipes. Aphrodite was one of three goddesses to compete for the golden apple of discord at the wedding. She stands in the third of the five chariots in the procession with her fellow competitors, Hera and Athena, riding the first and last respectively.